Looking for a Springy Pavement Sign? When you have a business, sidewalk café, or storefront on a bustling street, it’s a good idea to advertise your wares in a place where it will get noticed by pedestrians and all of the foot traffic that passes your premises. 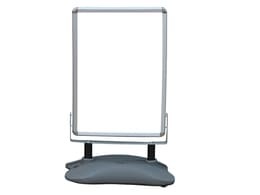 Pavement boards are an eye-catching way to get potential customers to notice and read your advertisements, because they are made so they sit on the pavement directly in the sightline of passers-by. Any business or shop owner can utilise pavement boards to boost their sales and get word out about their merchandise. This is a nice, standard option for advertising on the street. 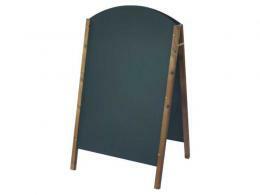 The A-frame board is weather-resistant and will accept both chalk and liquid chalk pens. The wood is sourced sustainably and is available in 5 finishes. This is a moisture-resistant option made with American Redwood for a classic look. It also takes chalk and liquid chalk pens. 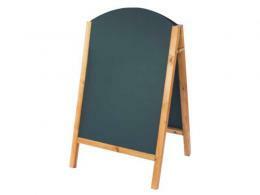 Another moisture-resistant option, this pavement board takes chalk and liquid chalk pens and is available in 3 sizes. The A-frame has a classic look and would look good on any sidewalk. This model is made with American Redwood and has a slightly curved top. 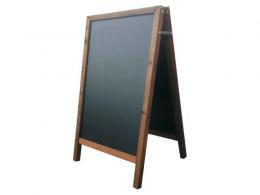 This A-frame board has the classic straight top and an American Redwood frame. 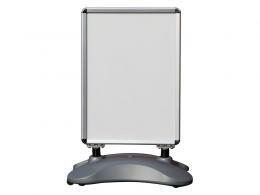 This model is rain and wind resistant, with locking arms for stability. The wood frame is sourced sustainably and the top edge is slightly curved. The Workplace Depot offers free delivery on all products. 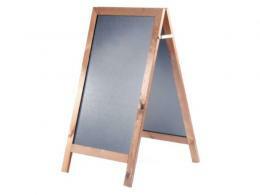 Our pavement boards come with a one year warranty including parts/labour. Shop with us for all of your workplace supplies and great deals to boot.